Every once in a while I get a little ambitious in my cooking for one, and feed myself for a week. Yesterday was one of those days, and I made more trips than I’d like to admit (three) to the grocery store before I finally managed to get all the ingredients together that I needed to make this creamy pasta dish from CHOW. 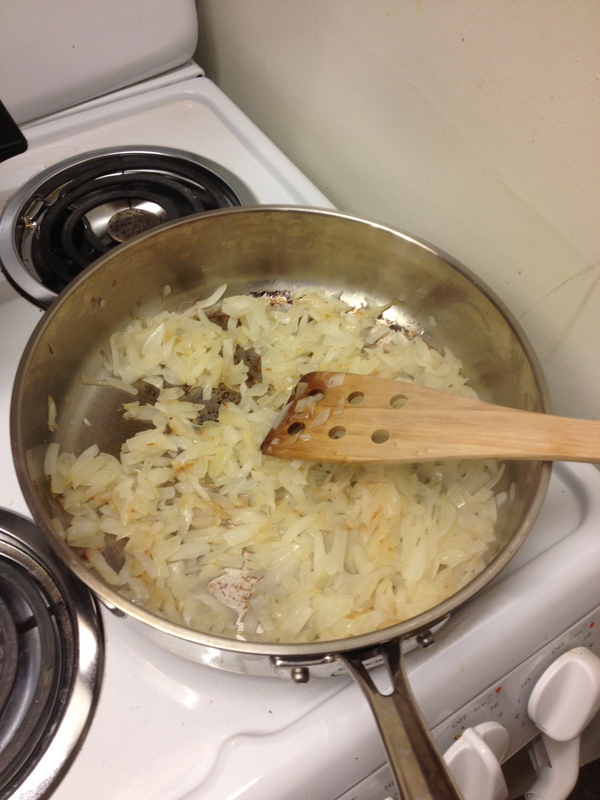 I loved it because I got to caramelize onions, which I think is super fun. 15 minutes down, 45 to go! 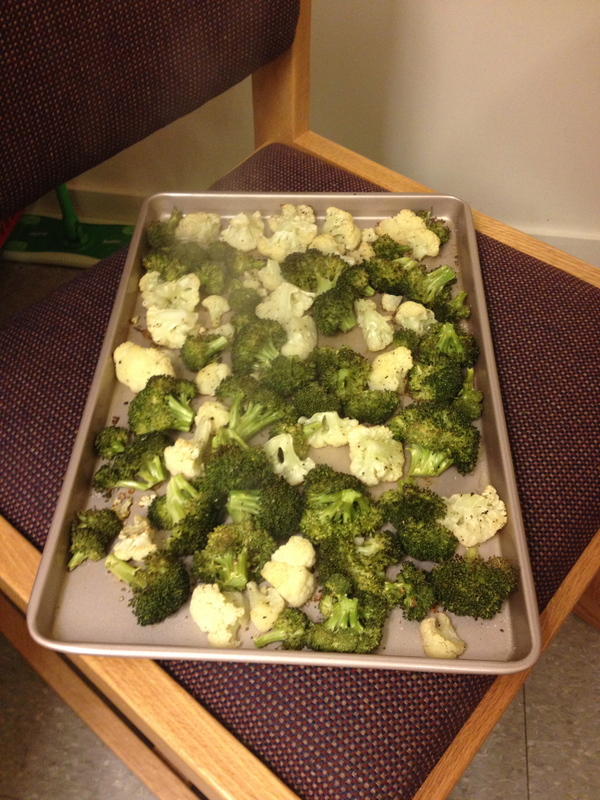 And it included roasted cauliflower and broccoli, which are some of my favorite vegetables! In efforts to always make things mom-friendly, I substituted roasted pecans for walnuts (which she hates). I’m not sure how it would have been with walnuts, but my strongly roasted pecans along with the nutritional yeast gave this dish a delicious rich, nutty flavor. I made one other substitution too… coconut cream for coconut milk. Remember, it’s good fat! When I was making the sauce, I ended up with a crumbly mixture rather than a sauce after adding the nutritional yeast, but I just forged ahead with the other ingredients and it turned out great. I was too busy whisking to get a good picture there! And you should see the leftovers! The sauce really does have a cheesy consistency to it, though all the flavor comes from the pecans, nutritional yeast, onion, and garlic. 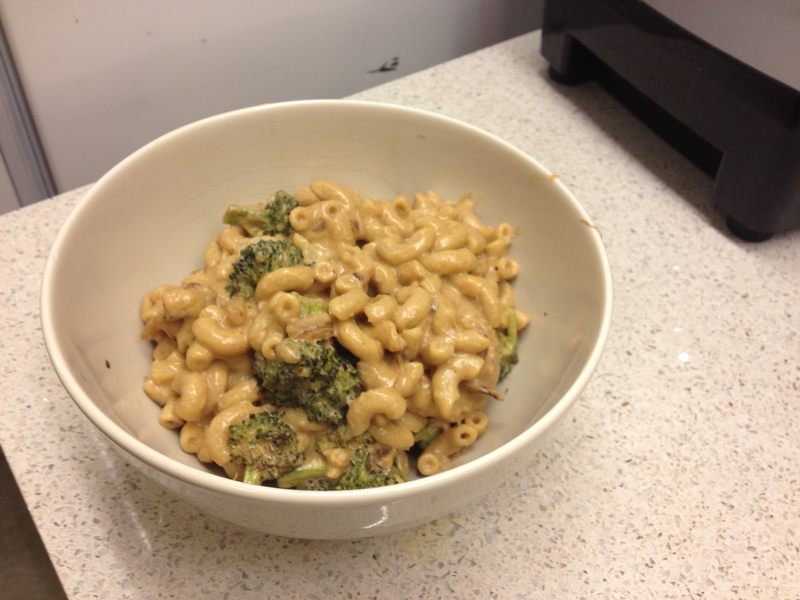 The broccoli really holds onto the sauce which makes them decadent little bites. Next time I make this, I’d love to pump up the vegetables! To me, there are never enough!